Last week I wrote about my Farmer's Market shopping spree and through the week I've made a few recipes with my produce. I discovered two new recipes for kale and I made my children eat beet greens (they didn't eat a lot but they ate some). I researched kale and found 9 reasons to eat kale and if you click the link you can read them also. Loads of fiber, antioxidants and vitamin K.
2. Transfer the cooked vegetables to a 4- to 6- qt slow cooker, add the lentils, stock, and tamari; cover and cook on Low for 8 hours. (this is where I completely veered off recipe and made the entire thing in the same large saute skillet-apparently I LOVE heating up my kitchen in the heat of the summer) Season with salt and pepper. 3. Meanwhile, or beforehand, tightly roll the kale leaves up like a cigar and cut them crosswise into thin ribbons. 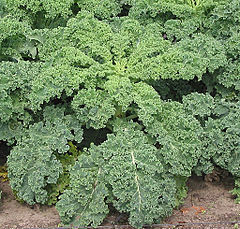 Cook the kale in a pot of boiling salted water, about 5 minutes, and add to the soup when ready to serve. I served ours over brown rice and I didn't boil the kale down. I just popped it into the lentil mix about 10 minutes before eating and it wilted enough for us. It was yummy! 1. Saok the beans for at least 8 hours in plenty of water to cover. Drain the beans. 2. In a large saucepan or Dutch oven, combine the beans with the water, onion, thyme and bay leaves. Cover and bring to a boil. Reduce the heat and simmer partially covered, until the beans are tender, approximately 1 1/2 hours. 3. Remove and discard the onion, sprigs of thyme and bay leaves. At this point beans could be refrigerated for up to 1 day before continuing the recipe. Bring the beans and their liquid to a boil. Add the kale and the salt and pepper to taste. Simmer, stirring down the kale every few minutes, until the kale is tender, about 10 minutes. Stir in the meat, if using. 4. Meanwhile, heat the oil in a small heavy skillet over very low heat. Add the garlic and cook until fragrant and soft, stirring occasionally for about 5 minutes. Do not let garlic brown. Mash the garlic with a fork. Add the hot pepper flakes, if using. 5. Pour the hot oil mix over the beans and greens and serve immediately. I mentioned that our dinner had kale leaves in it and he said...oh, hmmm, that sounds good-I've heard kale is really healthy! Wow. Needless to say everyone ate both recipes and I went ahead and bought more kale at the market today. Also we had some ham from a local farmer so I did cube that up, heated it, and put the bowl on the table for our occasional meat eaters to add to the own plates. My own garden has baby eggplants growing, okra (we've already eaten 5 pods from our two plants), tomatoes, basil, two kinds of peppers. 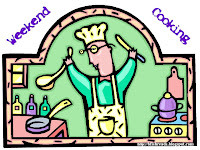 This post is linked to Beth Fish Reads Weekend Cooking meme; anyone can play along with a food-related post. Click her link to see her review of Danyelle Freeman's new book Try This.